Dedicated to my father who has never been paid to fan himself. The artwork A Dream Came Through started as an idea in 2006 and was developed in 2008 before the current capitalistic crisis and temporary rebirth of a social conscience in the Western World. 2006 was a time when a critique of the capitalist models of production of riches and their lack of distribution was neither fashionable nor intellectually sensible. The focus of the artwork is on the interpretations and re-interpretations of the roles of the migrant and the politics of labor. The performative element of the project also challenges and questions the structural frameworks of labor by highlighting a condition of commodification and exploitation that is globally enforced. A Dream Came Through exploits the idea of being paid to do ‘nothing’ by asking a group of local workers to be paid to fan themselves for the duration of a working day – eight hours. The clash between the oneiric representation of a life-long ideal ‘being paid to do nothing’ and the reality of exploitative labor frameworks reveals the impossibility of any labor to be other than an institutional process of enslavement. The artwork questions the representations of ‘dream societies’ that, having promised economic liberation, deliver no more than an experience of commodification and enslavement within the hierarchical realities of economic exploitation. The art world, in this context, with its systems of art production does not escape these phenomena of commodification but rather, by presenting itself as a form of liberation and empowerment, reproduces the very hierarchies that declares to be fighting. While the rampant economies of hedge fund investors, creative financiers and ‘adventurous capitalists’ of the turning of the 21st century vane on the horizon, the satellite states of the European Union look to capitalism still as their only possible economic salvation. Betrayed by socialist ideals, they are embracing what remains of the economic haven offered by the European Union as an attractive option. This is the opportunity of a lifetime for a few, particularly within the arts, and a baseless exercise in simulacral cultural consumption for the masses. The disappearance of cultural and historical traditions, of folksy imageries and sublanguages inherited in the local traditions through centuries of cultural engagements and survival, has become the systematic outcome of the tens of localized ‘biennales and art fairs’ that promise cultural regeneration by the repartition of EU funding streams. While local authorities, cultural operators and artists consume budgets for aesthetic regeneration of a territory, the territory and its population consume and are often consumed by recycled and institutionally neutered conceptualizations and social policies of post-modernized art. If Jean Baudrillard in defining this process of art consumption uses the expression ‘conspiracy of art’, Pier Paolo Pasolini was very blunt in his historical definition of the disappearance of traditions in Italy in the 1960s and 1970s, swept away by the processes of McDonaldization and Disneyfication through the imitation and imposition of values and cultural approaches imported from the United States. Are the artists and their art for regeneration assisting the satellite states of the European Union in a similar process of cultural disappearance as Pasolini discussed in the article titled Il Vuoto del Potere or L’articolo delle Lucciole published in “Corriere della sera” February 1, 1975 1Pier Paolo Pasolini, "‘Il Vuoto del Potere’ ovvero ‘L’Articolo delle Lucciole,’" Corriere della Sera, February 1, 1975, (accessed September 1, 2009). In this artistic and social context of cultural signs multiplying and mirroring each other in an infinite simulacral structure that leaves no space for reality, the disappearance of culture may represent nothing other than just one of the many possible deflections in the orgiastic re-presentation of images. A Dream Came Through, an artwork in multiple formats and media started in 2008, grapples with the disappearance of historical cultural elements in the satellite states of the European Union – starting with Romania, Turkey and Cyprus. It also analyzes the process of disappearance of the individual who, trapped within the multiplied mirroring signs of exploitation, ends up as a simulacral and void sign of a general condition of use and abuse. As an art project, A Dream Came Through consists of a series of conceptual artworks and performative events that are based on replicating, within a fine art context, the processes of economic enslavement and outsourcing. The New International Division of Labor (NIDL), as a follow up to the 1950s and 1960s late colonialist and neo-colonialist approaches to the management of migration for cheap labor, has generated new frameworks for the commodification of labor. 2David Drakakis-Smith, The Third World City (London: Routledge, 1987), 25-28. The arts do not escape these processes and if artists and curators have borrowed promotional techniques in the past from the advertising industry in their development of new aesthetics, they are currently borrowing methods of commodification from the corporate industry, basing their global success on cheap labor, outsourcing and commodification of the individual. A Dream Came Through outsources and objectifies people to demonstrate the circularity and self-referentiality of the commodification process that within the arts becomes an imposed cultural activity carrying political, economic, social and cultural restrictions. The commodification process of labor is increasingly built on a workforce, like that of the migrants, that is blinded by the “false frontier effects” 3Paul Virilio, The Information Bomb, trans. Chris Turner (London: Verso, 2000), 25. for example in the United Kingdom, France, Germany, Spain or Italy. This is a frontier that offers no possibility of representation of the dramatic realities of dematerialization and change but presents the worker with the illusion of upward social mobility. According to Pasolini cultural change should have been constructed by merging the two different concepts of development and progress, which instead, divergent and oppositional, generated a new divide between those who manipulate signs under the disguise of deception for a false frontier effect and those who consume signs in order to be manipulated and deceived for the illusion of upward social mobility. A Dream Came Through, which started in Romania with a series of artistic exploitations, enslavements and transfers of labor, is a project and an artistic process that, by participating in the erasure of a previous history and aesthetic, leaves to the local people money instead of a new subcultural aesthetic product with the ambitious tag of ‘art for regeneration.’ The art project is in itself an imitation of cultural processes that by shifting the signs exchanges old hierarchical structures for new ones. The process of enslavement as well as that of self-enslavement are both revealed as part of an expendable system of socio-political signs, where the willingness to reduce someone into slavery has to correspond to the willingness of that someone to be exploited. This is a process that reveals the freedom of the exploiter in the choice of exploitable individuals who often do not have any other choice but that of entering in a contract of enslavement. Art and the artist reveal the structure of exploitation that, even when distributing money and not subaesthetics, works constantly in favor of the exploiter and against the exploited. A Dream Came Through, as an art project that evidences these multiple layers of cultural disappearance and exploitation focuses on the revelation of the capitalistic exchange. No longer paying for local bourgeoisies to generate aesthetics to be consumed by the masses, but instead paying the masses to create an artwork to be aestheticized by the bourgeoisies. The process of exploitation continues following the trajectory of disappearance in a landscape of deception where the art project declares its exploitative structure and enslaving premises while at the same time revealing a game of deception played by cultural and political operators. The artist has employed art workers who have been objectified and reduced to being ‘one of the media’ upon which the artwork is constructed. Once purchased and enslaved, these ‘employees,’ as a commodified and outsourced workforce, become part of the artwork itself. A Dream Came Through pays homage to the cultural laborers that, instead of the anonymity of working in Damien Hirst’s Factory, 5"Upstairs in the inner sanctum of the White Cube Gallery, in an area reserved for serious buyers away from the prying eyes of the public, I ask a question that sales assistant Richard Thompson finds uncomfortable: did Damien Hirst do anything on this painting except sign it? ‘Well, er, Damien had a huge amount of input,’ he says cagily. But did he physically do anything? Thompson averts his gaze and skilfully changes the subject." David Cohen, "Inside Damien Hirst’s Factory," The Evening Standard, August 30, 2007, (http://www.thisislondon.co.uk/arts/article-23410356-details/Inside+Damien+Hirst&apos;s+factory/article.do, accessed September 19, 2009). have the so-called advantage of being aesthetic signs of a cultural disappearance by being visible as media of the artwork. Fig.2 Fanning Action no 1, artwork by Lanfranco Aceti, exploitative action, 2008 (media: Mihaela Varzari, curator; Alex Grigoras, photographer; and Ciprian Croitorul, model and visual artist). The focus of A Dream Came Through is that of unmasking the exploitative forms of art-participation and art-regeneration imposed upon a community that rarely benefits from forms of artistic interventions together with an analysis of the conflict between willingness and necessity to be exploited. This performative new media art project was based on the desire expressed by my father, an Italian metalworker today in pension, to be paid to fan himself; an expression that in the Italian language is a euphemism for doing nothing. Contemporary globalized frameworks, having generated new forms of exploitation – through a sense of false participation and engagement that minimally benefit the communities and strongly reinforce curators, artists, national institutions and international agencies’ agendas – offer the opportunity of revealing the process of the disappearance of doing nothing as an act of rebellion. Even participating in doing nothing can become a simulacral deception that reveals the layering of complex manipulations and contractual legalistic entanglements that ultimately benefit the exploiter that in this case is the artist. The exploiter is the enforcer of cultural agendas that represent a match between enforced institutional cultural values and the artists’ innocuous or non critical artworks. The artworks – at times rendered innocuous and at times chosen because they are neutered – are imposed upon communities in order to satisfy bureaucratic guidelines and literally ‘tick boxes’ of required outputs in order to cash in the allocated project money. The art laborer, the exploited soul, is all but a conveyer of signs – an expendable and swappable figure in a context of globalized modernization and constant transfer of ‘exploiting jobs’ in exploitable realities. Fig.3 Fanning Action no 2, artwork by Lanfranco Aceti, exploitative action, 2008 (media: Mihaela Varzari, curator; Alex Grigoras, photographer; and Ciprian Croitorul, model and visual artist). What then is the role of art and what is, in this context of art conspiracy, the role of the artist and that of the curator? Are they representative of new forms of exploitation, which, disguised with the clothes of community participation and regeneration of the territory, deliver nothing other than the imposition of an institutional agenda in which artists and curators alike participate in order to further an aesthetic strategy of the disappearance? Is there any space left for critical and disruptive interventions that reveal the deception of systems and collusions of power without entering into the traditional schemes and frameworks of shifting cultural signs? Fig.4 Fanning Action no 3, artwork by Lanfranco Aceti, exploitative action, 2008 (media: Mihaela Varzari, curator; Alex Grigoras, photographer; and Ciprian Croitorul, model and visual artist). The answer could be found in the possibility of a direct participation in the democratic processes that have to be rethought and substituted with forms of direct social self exploitations and disappearance. If direct social exploitation is the basis of contemporary democracies, where the participation process is that of sharing the exploitative self-reinforcing democratic ‘illusory and simulacral’ social engagements and interactions, then direct self-exploitation becomes the ultimate capitalist goal for a liberation of the self. The self-exploitations of curators, artists and photographers in A Dream Came Through is nothing more than an ultimate attempt to cut the middle management out of the global processes of exploitation and cultural self-disappearance. Fig.5 Fanning Action no 4, artwork by Lanfranco Aceti, exploitative action, 2008 (media: Mihaela Varzari, curator; Alex Grigoras, photographer; and Ciprian Croitorul, model and visual artist). The process of self-commodification and exploitation could represent the ultimate egalitarian approach to “the morality of creativity, which is of a piece with the morality of interactivity and political democracy. 6Jean Baudrillard, Paroxysm: Interviews with Philippe Petit, trans. Chris Turner (London: Verso, 1998), 106. The immolation of the self in the process of cultural disappearance is the ultimate creation of objects that are “without value judgements, without references and without history; objects substitutable one for another, as are most artworks today,” 7Ibid., 107. or most people that are objectified and trapped in a social process of commodification. Fig.6 Fanning Action no 5, artwork by Lanfranco Aceti, exploitative action, 2008 (media: Mihaela Varzari, curator; Alex Grigoras, photographer; and Ciprian Croitorul, model and visual artist). The aesthetic becomes subservient to nothing else than money in the production of objects that have absolutely no value and represent no reality, while money is a sign and signifier of something else. Baudrillard is correct in affirming that the conspiracy of art is nothing other than a form of abuse through the representation and reproduction of simulacra, as much as money is the sign of a constant enslavement. The soft power of the European Union becomes, in a Baudrillardian symbolism, representative of an ideological imposition that selects and favors aesthetic and cultural imperatives. The aesthetic of A Dream Came Through is to engage with the complexities of a globalized society within which hidden forms of exploitation are revealed by the disappearance of devalued cultural meanings and the appearance of the void. 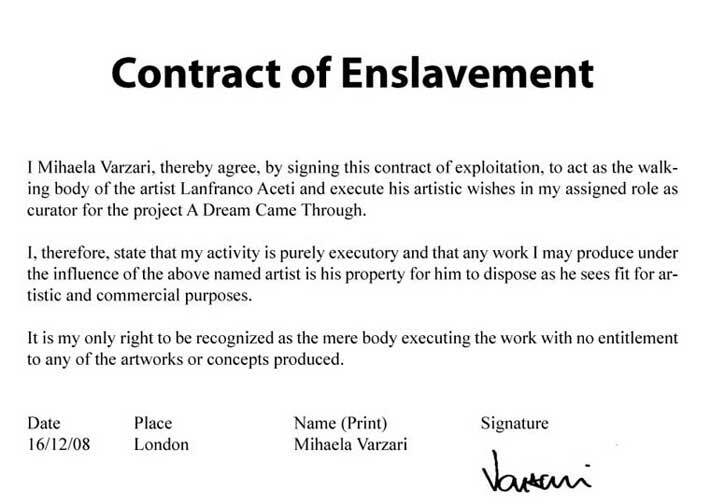 Fig.7 Contract of Enslavement no 2, artwork by Lanfranco Aceti, exploitative action, 2008 (medium: Alex Grigoras, photographer). The disappearance of art is the sign of a new series of unavoidable changes that through deception, by showing forms of exploitation and conquest, disguise the nature of power relations. The disappearance of art and the commodification of the self are neither a minimal nor inconsequential events. They deceive the eyes by forcing the gaze onto the visual signs of an institutional message of egalitarianism while the institutional power perpetuates itself. 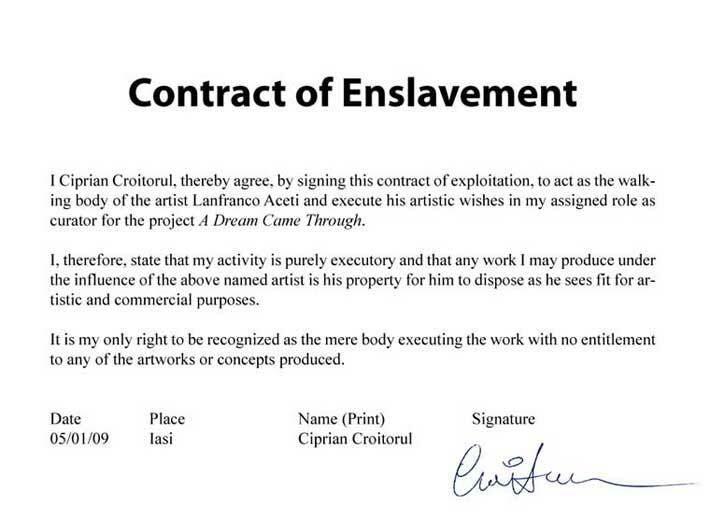 Fig.8 Contract of Enslavement no 3, artwork by Lanfranco Aceti, exploitative action, 2008 (medium: Ciprian Croitorul, model and visual artist). Baudrillard, Jean. Paroxysm: Interviews with Philippe Petit. Translated by Chris Turner. London: Verso, 1998. Cohen, David. “Inside Damien Hirst’s Factory.” The Evening Standard, August 30, 2007. (accessed September 19, 2009). Drakakis-Smith, David. The Third World City. London: Routledge, 1987. Medail, Cesare. “Il ‘mea culpa’ di Giulio: Pasolini Aveva Ragione, Dietro il Potere il Vuoto.” Corriere della Sera, March 28, 1993. (accessed September 20, 2009). Pasolini, Pier Paolo. “‘Il Vuoto del Potere’ ovvero ‘L’Articolo delle Lucciole.’ Corriere della Sera, “February 1, 1975, (accessed September 1, 2009). Virilio, Paul. The Information Bomb. Translated by Chris Turner. London: Verso, 2000. Dr. Lanfranco Aceti works as an academic, artist and curator. He is Associate Professor in Contemporary Art and Digital Culture at the Faculty of Arts and Social Sciences, Sabanci University, Istanbul, and Chief Editor of the Leonardo Electronic Almanac. His work has been published in Leonardo and Art Inquiry and his interdisciplinary research focuses on the intersection between digital arts, visual culture and new media technologies. Dr. Aceti is specialized in inter-semiotic translations between classic media and new media, contemporary digital hybridization processes, Avant-garde film and new media studies and their practice-based applications in the field of fine arts. He is also an Honorary Lecturer at the Department of Computer Science, Virtual Reality Environments at University College London. He has exhibited works at the ICA in London and done digital interventions at TATE Modern, The Venice Biennale, MoMA, Neue Nationalgalerie, the ICA and the Irish Museum of Modern Art. 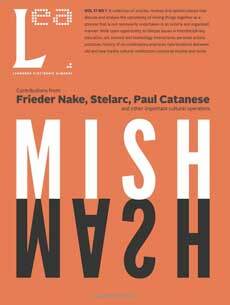 Previously an Honorary Research Fellow at the Slade School of Fine Art, Dr. Aceti has also worked as an AHRC Postdoctoral Research Fellow at Birkbeck College, University of London, School of History of Art, Film & Visual Media and as Visiting Research Fellow at the Victoria and Albert Museum.